A sneaky child gets ready to go out into the rain. With her umbrella at the ready, the young girl peers outside. 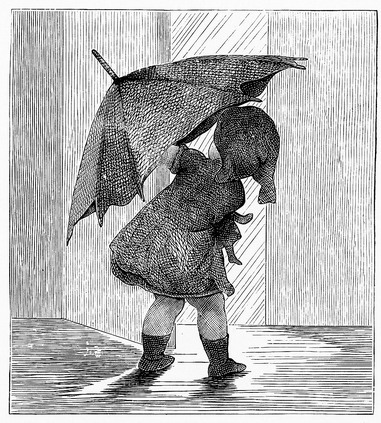 This image is one of a series of charming illustrations depicting one young girl’s adventure out into a rainstorm. Use these images alone or as a group. They are from the 1882 work Golden Rays which identified the engraver as Samuel E. Brown (d. circa 1860) but did not include author or illustrator information.